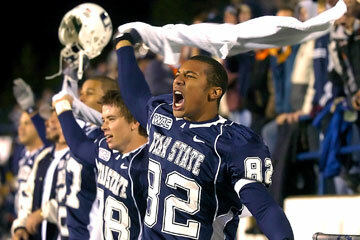 Xavier Bowman celebrated during the final seconds of Utah State's win over Fresno State. LOGAN, Utah » Freshman quarterback Riley Nelson threw a 30-yard touchdown pass to Kevin Robinson with 55 seconds remaining yesterday to lead Utah State to its first victory, 13-12, over Fresno State in the Western Athletic Conference. Nelson, who graduated from Logan High School, made his first start for the Aggies (1-5, 1-1). The winning touchdown came after Clint Stitser's 29-yard field goal gave Fresno State (1-4, 1-1) a 12-7 lead with 3:56 to play. Nelson marched the Aggies to Fresno State's 18 with 1:28 left. He hit Robinson in the end zone for what appeared to be the go-ahead score, but the touchdown was scratched when the receiver was called for pass interference. But Nelson got another chance, hitting Robinson on a third-and-22 play to win the game. In the first quarter, he threw a 54-yard touchdown pass to Marcus Cross on a screen play, giving the Aggies a 7-0 lead. Fresno State tied the score in the third quarter on a 60-yard pass from Tom Brandstater to Chastin West. The Bulldogs also got a safety when Utah State's Ryan Wilson snapped the ball over the head of punter Leon Jackson III, who kicked the ball out of the end zone. Stitser missed two field goals for Fresno State, from 42 yards and 27 yards. MOSCOW, Idaho » Brian Flowers ran for 91 yards and a pair of touchdowns, leading the Vandals past the Aggies. NMSU closed within eight points of Idaho when quarterback Chase Holbrook connected with Derek DuBois on a 21-yard touchdown pass with 2:09 left. Marlon Haynes secured the ensuing onside kick to lock up the victory for Idaho. The Aggies entered the game as the nation's top-ranked passing offense and showed glimpses of that. Following the Vandals' first score, Aggies receiver Chris Williams got behind the Idaho defense for a 96-yard touchdown reception. A.J. Harris added another long score late in the first half when Holbrook connected with him on a 47-yard touchdown. CORVALLIS, Ore. » Alex Brink threw for 270 yards and a touchdown as the Cougars defeated the Beavers in a turnover-filled game. It was the Cougars' first win in Corvallis in 10 years and their first win in October since 2003. Jason Hill caught five passes for 121 yards for the Cougars,. Matt Moore was 18-for-34 for 223 yards for Oregon State. Sammie Stroughter caught six passes for 124 yards. TUSCALOOSA, Ala. » John Parker Wilson threw two touchdown passes and the Crimson Tide pulled away with two late scores to beat the winless Blue Devils. Wilson's 9-yard scoring pass to Keith Brown put the Tide ahead for good at 16-14 late in the third quarter after Ramzee Robinson's interception gave 'Bama the ball at the Duke 40. But the Tide never got any breathing room against Duke until the waning minutes of the game, when Jimmy Johns capped a nine-play drive with a 2-yard touchdown run and Lionel Mitchell returned an interception 50 yards for another score. FORT COLLINS, Colo. » Caleb Hanie threw for a touchdown and ran for another in the third quarter to lead the Rams past the Rebels in the Mountain West Conference opener for both teams. Hanie finished 23-for-28 for 257 yards passing. Damon Morton had five catches for 114 yards and a touchdown. Gartrell Johnson ran for a touchdown and a career-high 47 yards for Colorado State. CHARLESTON, Ill. » Cole Stinson passed to Micah Rucker for three touchdowns and the Panthers defense did the rest in a win over the Redhawks. Rucker finished a busy afternoon with 180 yards on 10 receptions as Stinson completed 16 of 22 passes for 208 yards and no interceptions. The Panthers turned in a near-perfect effort on pass defense, limiting Southeast Missouri to just 24 total passing yards. Eastern Illinois also forced two Redhawk interceptions and a fumble.